Discussion in 'Gibson SG' started by lawrev, May 26, 2018. I'm looking at purchasing a Pelham Blue SG T. What are your thoughts on them and can you share some pictures? Slightly better in my opinion than the 2018 standards which have different pickups. Someone will post pics of blue one personally ha ha i like the black aka ebony model! If you buy it your probably going to like it a lot but play it if you can first. Dale, 58pit, syscokid and 1 other person like this. Dale, syscokid, lawrev and 4 others like this. 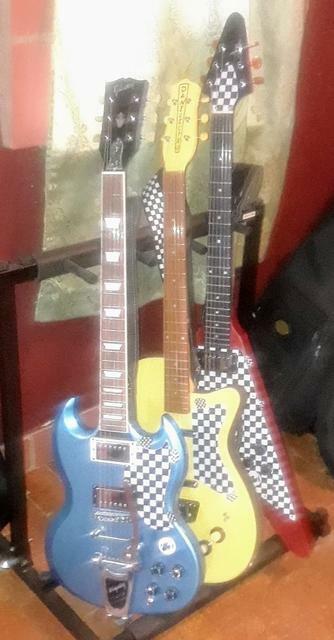 The checker flag pickguards are very cool. Where did you get them? I'm a big fan of auto racing and could see getting a checkered flag pickguard on a Pelham Blue Standard. My first SG after owning Fender guitars for decades. Not the best picture but a great guitar. papagayo, Dale, 58pit and 5 others like this. For the OP I want to add that Gibson has done a really nice job of constructing and finishing the 2017 SG standards at least all the ones I have seen. Solid construction and painting/finishing. I still need to get mine into a luthier at some point to check probably tweak/file the nut a little bit but low priority at this point. The neck and fretboard are so easy to play on and just gorgeous although mine looks a little darker now after a couple of treatments with guitarnomad f-one oil. I'm a big fan of the grover locking tuners that the 2017 standards come with makes changing strings faster/easier. Back to the OP let us know what you decided eventually and if you buy it we need pics! Yes, the grain does show through the blue to an extent. Also a huge fan of the locking tuners. After playing Strats, Teles and Les Pauls for years I immediately asked about this guitar "where have you been all my life"? The slim neck taper may not be for everybody but it fits my style perfectly. I have an Ebony 2017 and I’m in love with it !! Great guitar with awesome pickups and Grover locking machines . I think SG's are great in any color, but Pelham blue they are just striking. And the only Gibson I would hesitate to own is a 2015 of any sort, hate the necks and those tuners. But a 17'in Pelham blue, I am in. Thanks for all the responses! I currently own a 2018 SG Jr, which is simply fantastic - great player and very resonant (to play without plugging in) when I want to practice scales. The Pelham Blue is simply a beautiful guitar and would rather get that in the Gibson USA line rather than the Custom Shop. Same goes with a TV Yellow Standard, which is mostly a Custom Shop item it would appear. I will definitely share pictures when I get the next SG. Be aware that the blue will eventually turn green. Dale and lawrev like this. i love them for that very reason. once they start to age they turn everess green. Finally finished my 2017 Pelham Blue SG Standard T.
Bought as a stripped body. Grover tuners, soon to have Hipshot tulip buttons. Gibson locking bridge from an HP model. papagayo, Dale, lawrev and 3 others like this. Thanks! Starting with the right body makes the rest easy, it's just bolting on the parts. Killer guitars. 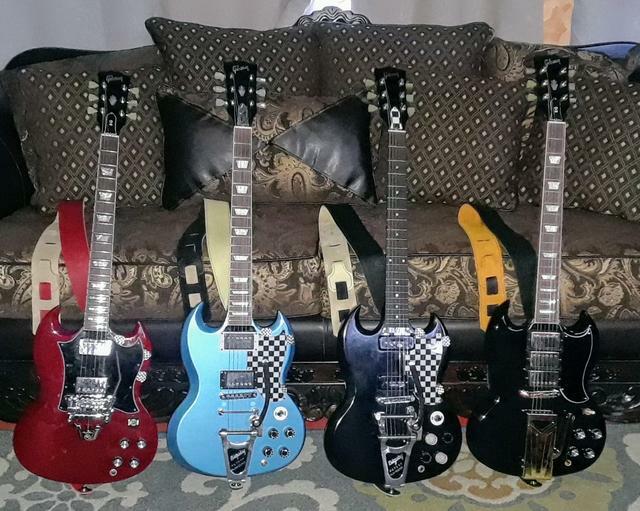 Of the half-dozen SG's I have owned it is easily the best one. My local music shop has a MINT 2017 Gibson SG Standard T Pelham Blue with the original guitar case and all of the case candy. They are asking $899.00. I couldn't believe just how gorgeous this SG is. I have owned a lot of Gibson SG's in my life however I have never seen one quite like this. Right now I am working "Part-Time". I interviewed for an awesome "Full-Time" position and I should be hearing from them very soon. This is why I didn't buy the guitar on the spot. I really love Alnico V Magnet based humbucker's. This SG has the Alnico II Humbucker's. I played it through a Marshall half stack, which is what I use, and the pickup's seemed to be okay. I know I could change them but honestly I'm so tired of buying guitars and then getting involved in swapping out pickup's or components. I much prefer 100% factory original. So this 2017 Pelham Blue SG looked amazing. I have never owned any other colors than Ebony and Heritage Cherry. The white binding really stands out and the Pelham Blue is just oh so sweet looking. I guess we'll see what happens. I have a cherry burst and love it. My best player in many ways. I know in the 60s this was true because the lacquer yellowed and yellow + blue = green. But with a modern finish is this still likely? The customs house ones try to use the same finishing materials so I could see that being a possibility for one of them but the Standards would be using modern materials.